IPLs and Conditional Modifiers can be Managed for each Initiating Event by clicking on the ‘+’ symbol located on the row of the required Event, or by right clicking on the Event and clicking Manage Event IPLs/Modifiers. This shows the IPLs and Conditional Modifiers configured on this Event. 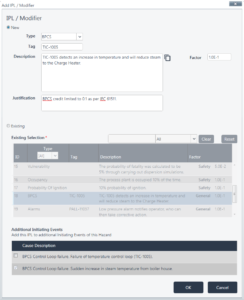 IPLs and Conditional Modifiers can also be managed for all Initiating Events on all Hazards. This is covered in a separate article. Conditional Modifiers reduce the consequences of the specified hazard following the event, however are not engineered. Certain Modifiers are only applied to consequence Categories. For example occupancy only applies to safety. To add a new IPL or Conditional Modifier, select ‘Add New’ in the ‘Manage Event IPLs / Modifiers’ window and select the ‘New’ radio button. When adding an IPL the factor will be applied to all Consequences (i.e. safety, environmental etc.) that are selected for that Hazard. When adding Conditional Modifiers different factors can be entered for the different consequence types (ie. Safety, Financial, etc). You can still provide one Factor to apply to all consequences types by checking “Apply to all consequences”. If adding individual Factors leave the field blank if the Conditional Modifier does not apply to the Consequence. Certain Conditional Modifiers can only be applied to specific consequence categories. The table below outlines which Conditional Modifiers should be applicable to which consequences. This is how the default Risk Profile is configured. This should be considered when setting up a custom Risk Profile. 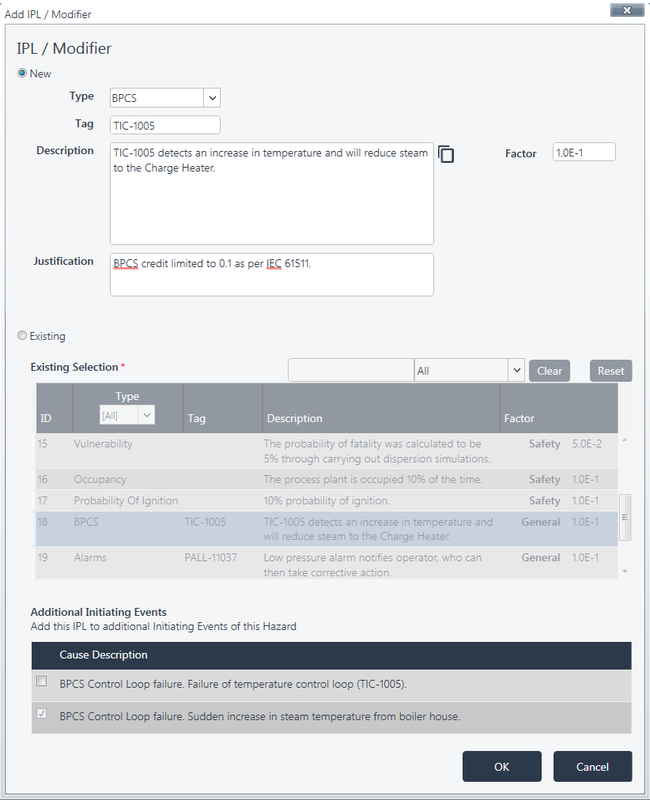 Tip – Use the Used Text Function to use previous text used in that field within any Hazards in the project. The same IPLs and Conditional Modifiers are often used again and again within a study. To help with this SIL Comp also allows you to re-use an existing IPL or Conditional Modifier that has already been defined during the study. This speeds up the study and simplifies the process, allowing you to make any corrections in one place instead of each individual instance. To add a new IPL or Conditional Modifier from an Existing one, select ‘Add New‘ in the ‘Manage Event IPLs / Modifiers’ window and select the ‘Existing‘ radio button. Note – When an existing IPL or Conditional Modifier is selected the data will appear in the fields at the top of the window. The user can then select “New” and the data will remain. This is a quick way to pre-populate the fields for a new IPL or Conditional Modifier that is very similar to one that already exists. When adding a new or existing IPL or Conditional Modifier it is possible to add them to other Initiating Events associated with the same Hazard. Just check the relevant Initiating Events in the “Additional Initiating Events” section of the “Add IPL / Modifier” window. Edit Master should be used when the existing IPL or Conditional Modifier has been used in several instances across a project and the edit applies to all instances. Using this feature will change the IPL or Conditional Modifier in every instance that it is used. 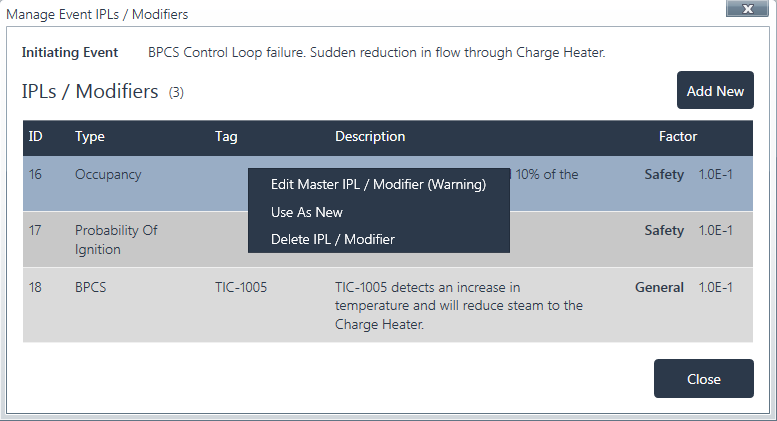 To Edit Master right click on the required IPL or Conditional Modifier in the “Manage Event IPLs / Modifiers” screen and select “Edit Master IPL / Modifier (Warning)”. Warning: Editing the IPL or Conditional Modifier whilst selecting this option will affect this IPL or Conditional Modifier in all other instances where it has been used. If the existing IPL or Conditional Modifier has been used in several instances but needs to be changed only for one specific instance, select Use As New. 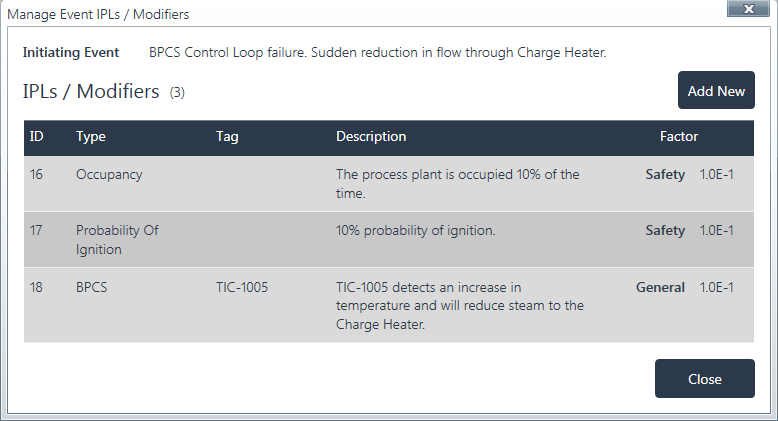 Using this feature will create a new IPL or Conditional Modifier using the same data, allowing you to edit it without affecting the other instances where the original IPL/Conditional Modifier is used. To Use As New right click on the required IPL or Conditional Modifier in the “Manage Event IPLs / Modifiers” screen and select “Use As New”. You can now edit the IPL or Modifier without affecting the original.